Aquarium fish trade is a very important sector in all over the world (Winfree, 1989). Trade of ornamental fish is a multi-million dollar business which includes one hundred countries. They are an important source of overseas benefit for many rustic communities in Africa, South America and South East Asia. Thousands of types of aquarium fish (commonly, poeciliids, guppy and cichlids) are kept by hobbyists. The largest part of the aquarium fish industry is the freshwater aquarium fish sector (Helfman, 2007). Although it has many positive contributions, the ornamental fish trade may have adverse ef-fects as a result of the introduction of nonnative species and spread of different diseases agents (Andrews, 2006). The occurrence of parasites at ornamental fish, in Turkey, has been documented by different papers (Koyuncu and Cengizler, 2002; Koyuncu, 2009; Kayis et al., 2009). These studies include many protozoan and metazoan parasites and also their host fish such as; Ichthy-obodo sp., Ichthyophthirius multifiliis, Chilodo-nella sp., Trichodina spp., Dactylogyrus exten-sus, Gyrodactylus bullatarudis, Lernaea cyprina-cea, Argulus foliaceus, Argulus japonicus and Capillaria sp. from gold fish, guppy and cichlids (Koyuncu, 2009), Ambiphyra spp. from guppy (Kayis et al., 2009) and Oodinium pillularis from Poecilidae (Koyuncu and Cengizler, 2002). Ornamental fish pathogens spread very quickly in the world because of their commercial benefits. Therefore, routine infectious diseases controls are very important for risk analysis and precaution steps. For these reasons, we aimed to isolate and identify different protozoan and meta- zoan fish parasites from variety of aquarium fish species in Turkey between 2009 and 2010. A total of 55 fish from 10 different ornamen-tal fish species, astronot Astronotus ocellatus, (3), goldfish Carassius auratus, (11), discus Symphsodon discus, (3), beta Betta splendens, (2), guppy Poecilia reticulata, (5), convict cichlid Cichlasoma nigrofasciatum, (13), blue streak hap Labidochromis caeruleus, (8), angelfish Ptero-phyllum scalare, (2), black molly Poecilia sphe-nops, (3) and severum Heros efasciatus, (5) were sampled each month between 2009 and 2010 from the aquarium unit of Fisheries Faculty at Rize University, two different pet shops in Rize at the North East part of Turkey and one aquar-ium fish hatchery in İstanbul at the North West part of Turkey. Live fish were transferred to fish diseases la-boratory at the Fisheries Faculty with aerated water with portable air pump or plastic bags in-cluding ice and examined for external (skin, fins and gills of fish) and internal (intestine and blood of fish) parasites. The parasites, if found, were identified according to the methods described by Lom and Dykova, 2002 and Shinn et al., 2004. Parasites, their host and location of parasites in fish were recorded. Prevalence of parasites was determined for both total and also each fish spe-cies. Nine protozoans, ciliate (6), flagellate (2) and dinoflagellate (1) and two metazoans, monoge-nean (2) were identified in ten different fish spe-cies (Table 1). All identified parasites were ex-ternal except for Hexamita sp. Parasites were commonly observed on gills, however, Tricho-dina spp. and Epistylis sp. were observed on both skin and gills of fish. Table 1. 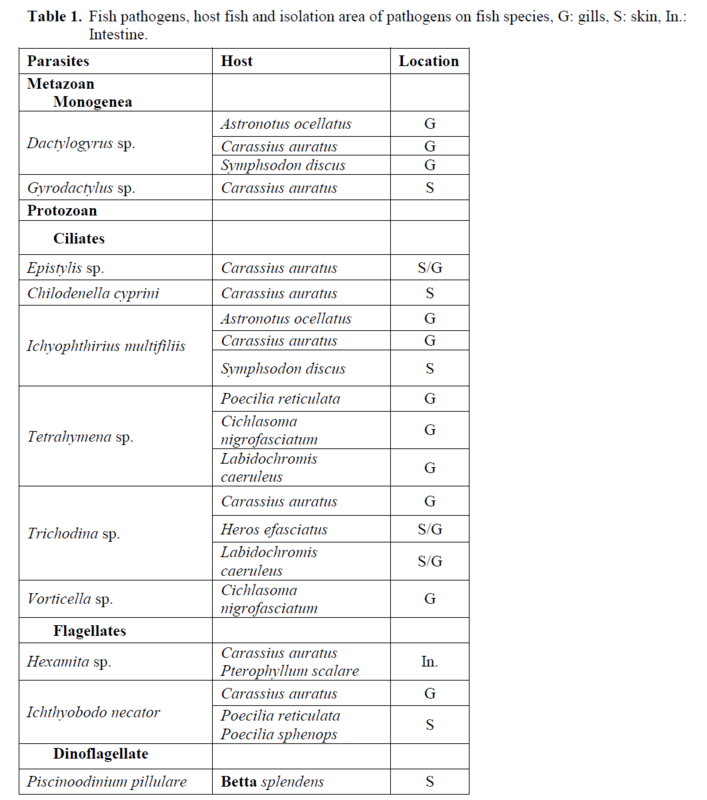 Fish pathogens, host fish and isolation area of pathogens on fish species, G: gills, S: skin, In. : Intestine. Clear hemorrhagic areas on the skin of Carassius auratus infested with Gyrodactylus sp. and destruction of gill, irregular scales and irrita-tion of fins of Astronotus ocellatus, with infested Dactylogyrus sp., were observed. Also the fish showed anorexia and lethargy. All parasites were isolated from gold fish, Carassius auratus except for Vorticella sp., Tet-rahymena sp. and Piscioodinium pillulare. Mix infestation of Trichodina spp. and Ichyophthirius multifiliis was observed on the gills of Carassius auratus. Prevalence of the parasites for each fish species was presented in Table 2. Different parasites species were reported from various ornamental fish species. Gyrodactylus katharineri and Gyrodactylus carassii from Carassius carassius were reported by (Koyun, 2000; Aydogdu, 2006) in Turkey. In this context, present study is similar to the previous studies. Twenty-one Dactylogyrus species have been re-ported from Carassius carassius, (Sağlam, 1992), Barbus esocinus, Cyprinus carpio, (Ozer and Ozturk, 2005), Chalcalburnus chalcoides, Vimba vimba (Soylu and Emre, 2007) Pseudophoxinus antalyae (Soylu, 1990), Rutilus rutilus, Blicca bjoerkna (Karatoy and Soylu, 2006), Abramis brama (Scott, 1985) in Turkey. The guppy Poe-cilia reticulata, which is an important ornamental fish, is host for Gyrodactylus bullatarudis and Gyrodactylus turnbulli (Scott, 1985). However, these parasites rarely were identified from orna-mental fish. According to this, only Dactylogyrus anchorarys have been reported from gold fish (C. carassius) (Koyun, 2000; Aydogdu, 2006) from Turkey. In the study, Dactylogyrus sp. was re-ported for the first time from Astronotus ocellatus in the country. Protozoan parasites have been reported par-ticularly in fish farms hatchery. Trichodina spp., Ichthyobodo necator and Ichyophthirius multi-filiis are the most important and common fish parasites in all aquatic systems. These parasites were reported from different consumed and or-namental fish species (Kayis et al, 2009). Unlike previous studies, Trichodina spp. from Heros efasciatus, I. necator from Poecilia sphenops and I. multifiliis from Symphsodon discus were re-ported in this study. Tetrahymena sp. is called guppy disease be-cause of its predilection for guppies. And also this parasite affects other fish such as cichlids and tetras (Lom and Schubert, 1983; Imai et al., 2000). However, Tetrahymena spp. has been rarely reported from fish in Turkey (Kayis et al, 2009). In the present study Tetrahymena was identified from Cichlasoma nigrofasciatum and Labidochromis caeruleus. Most reported dinoflagellate parasites were from aquarium fish (Lom and Schubert, 1983). Many tropical fish species, such as cyprinids, are susceptible to Piscinoodinium. Amyloodinium ocellatum from Dicentrarchus labrax (Cagırgan and Toksen, 1996) and Oodinium pillularis from Cyprinus carpio and Poecilia spp. (Saglam, 1992; Koyuncu and Cengizler, 2002) have been reported in Turkey. 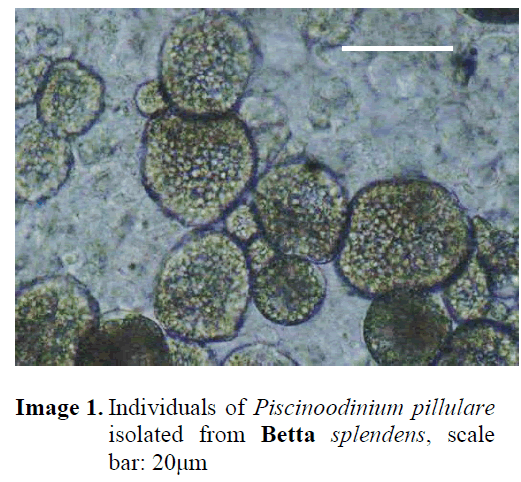 In the present study, Pis-cinoodinium pillulare was reported for the first time from Betta splendens in the country (Image 1). Although Vorticella sp. are free-living cili-ophorans, Epistylis sp. are sessile, colonial ecto-commensal ciliate attacking the surface of fish skin and gills (Lom and Dykova, 1992). Vorti-cella sp. was reported for the first time from gills of Cichlasoma nigrofasciatum in the present study. Fish parasites cause high mortality in aqua-culture and ornamental fish production particu-larly in larval stage of fish. Some of the fish which were sampled in the present study have been produced in Turkey, but some fish species were imported from different countries (Turkmen and Alpbaz, 2001). Therefore, this study shows that good health management’s practices, pre-vention of contamination and hygiene precau-tions are very important issues in fish productions and transport. 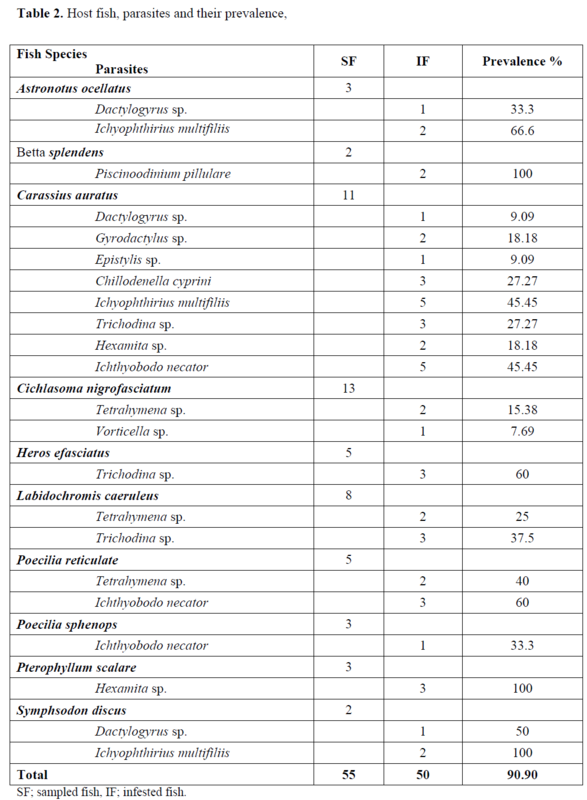 Aydogdu, A., (2006).Variations in the infections of two monogenean species parasitizing the gills of the crucian carp (Carassiuscarassius), in relation to water temperature over a period of one year in Golbasi Dam Lake, Bursa, Turkey, Bulletin of the Euro-pean Association of Fish Pathologist, 26: 112-118. Cagırgan, H., Toksen, E., (1996). Yurdumuzda kültürü yapılan levrek (Dicentrarchus labrax L.) juvenillerinde İlk Defa Görülen Amyloodinium ocellatum (Dinoflagellata) in-festasyonu, Pendik Veteriner Mikrobiyoloji Dergisi, 27: 197-205. Helfman, G.S., (2007). “Fish Conservation”. Is-land Press, Washington, DC. Karatoy, E., Soylu, E., (2006). Durusu (Terkos) GoluCapakBaliklari (AbramisbramaLin-naeus, 1758)’ nin Metazoan Parazitleri, TurkiyeParazitolojiDergisi, 30: 233-238. Kayis, S., Ozcelep, T., Capkin, E., Altinok, I., (2009). Protozoan and metazoan parasites of fish in the Turkey and their applied treat-ments, The Israeli Journal of Aquaculture-Bamidgeh, 61: 93-102. Koyun, M., (2000). The helminthes fauna of some fishes in Enne Dam Lake. PhD. thesis. Uludag University, Science Institution, Tur-key. Koyuncu, C.E,. (2009). Parasites of ornamental fish in Turkey, Bulletin of the European As-sociation of Fish Pathologist, 29: 25-27. Koyuncu, E., Cengizler. I., (2002).Mersin Bölge-sinde yetiştiriciliği yapılan bazı akvaryum balıkları (Poecilidae)’ında rastlanan proto-zoan ektoparazitler, Ege Üniversitesi, Jour-nal of Fisheries and Aquatic Science, 19: 293-301. Lom, J., Dykova, L., (1992). Protozoan Parasites of Fishes. Developments in Aquaculture and Fisheries Science, 26. 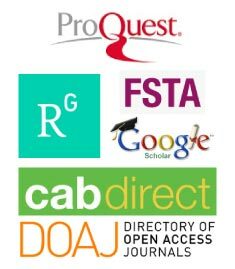 Elsevier Sci. Publ. B.V., Amsterdam. Ozer, A., Ozturk, T., (2005). DactylogyruscornuLinstow, 1878 (Monogenea) Infestations on Vimba (Vimbavimbatenella(Nordmann, 1840)) Caught in the Sinop Region of Tur-key in Relation to the Host Factors, Turkish Journal of Veterinary and Animal Sciences, 29: 1119-1123. Saglam, N., (1992).Some external parasites on Cyprinids in Keban Dam Lake, Master The-sis, Fırat University, Science Instution, Elazığ, Türkiye. Shinn, A.P., Hansen, H., Olstad, K., Bachmann, L., Bakke, T.A., (2004). The use of mor-phometric characters to discriminate specimens of laboratory-reared and wild populations of Gyrodactylussalarisand G. thymalli(Monogenea), Folia Parasitology, 51: 239–252. Soylu, E., Emre, Y., (2007). Monogenean and cestode parasites of Pseudophoxinusantal-yae, Bogustkaya 1992 and Cyprinuscarpio, Linnaeus 1758 from Kepez Antalya Turkey, Bulletin of the European Association of Fish Pathologist, 27: 23-28. Soylu, E., (1990). Sapanca Gölü’ndeki Bazı Balık Türlerinde Bulunan Digenean ve Cestod Parazitler, İstanbul Üniversitesi Su Ürünleri Dergisi, 12: 253-256. Turkmen, G., Alpbaz, A., (2001). 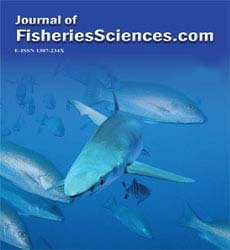 Türkiye’ye İthal Edilen Akvaryum Balıkları ve Sonuçları Üzerine Araştırmalar, Ege Üniver-sitesi, Journal of Fisheries and Aquatic Sci-ence, 18: 483-493. Winfree, R.A., (1989).Tropical fish: Their pro-duction and marketing in the United States, World Aquaculture, 20: 24-30.